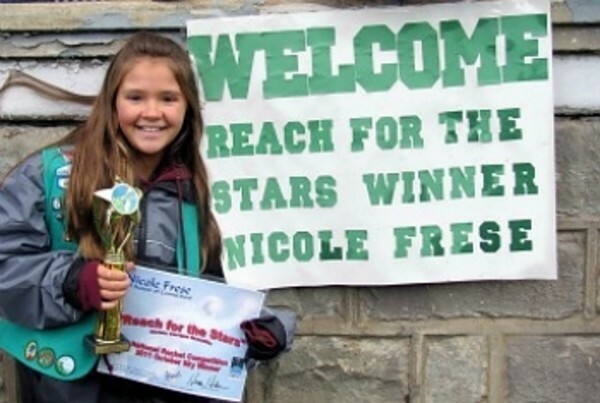 In Connecticut, the Shelton Patch that Girl Scout Nicole Frese took home top honors in the National Reach for the Stars Rocket Competition, as a result of her first-place finish during a Girl Scout rocket launch event at the Riverwalk in Shelton. Her rocket landed the closest to the target due to her angle and wind calculations, placing her first nationally in her age group. Frese was honored in October at the October Sky Festival in West Virginia. She had the opportunity to meet Homer Hickam, the original “Rocket Boy” who inspired the book and movie, “October Sky,” and was presented her award alongside two current astronauts. Frese participated in a Design and Discovery Day of Rocketry in May of 2011. During this program, made possible through a grant from Bruce N. Griffing Trust, 140 Girl Scouts each designed and launched two different types of rockets using regular household materials as propellants, and built her own 15-inch model rocket. In June, the 15-inch model rockets were launched by the girls towards a target at the Riverwalk, with Frese’s rocket coming in first overall.